Great fight scene. Loved watching a vampire that had Character. Stephen Dorff brought something special to the screen. Awesome movie. Great villain. Love the story and the fighting scenes. One of the best action flicks I`ve seen. Stephen Dorff played an excellent role as Deacon Frost. 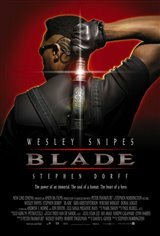 THE BEST MOVIE I EVER SAW ITS A GREAT ACTION MOVIE, IF U LIKE ACTION GO RENT BLADE NOW!!!!!!!!!!!!!!!!! It was the best action film of the year. It was amazing and exciting.